World economic growth has picked up, with advanced economies providing most of the uplift, while global inflation has remained subdued. 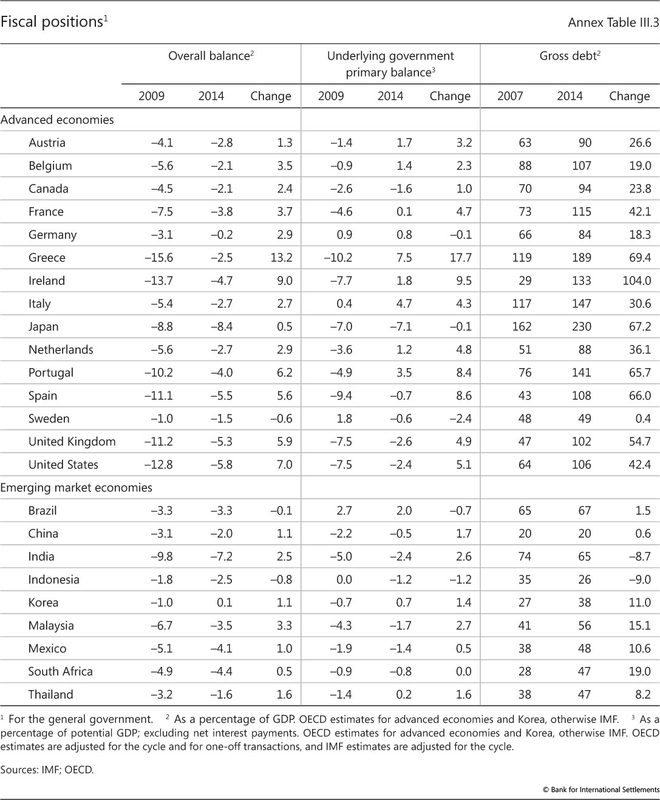 Despite the current upswing, growth in advanced economies remains below pre-crisis averages. The slow growth in advanced economies is no surprise: the bust after a prolonged financial boom typically coincides with a balance sheet recession, the recovery from which is much weaker than in a normal business cycle. That weakness reflects a number of factors: supply side distortions and resource misallocations, large debt and capital stock overhangs, damage to the financial sector and limited policy room for manoeuvre. Investment in advanced economies in relation to output is being held down mostly by the correction of previous financial excesses and long-run structural forces. Meanwhile, growth in emerging market economies, which has generally been strong since the crisis, faces headwinds. The current weakness of inflation in advanced economies reflects not only slow domestic growth and a low utilisation of domestic resources, but also the influence of global factors. Over the longer term, raising productivity holds the key to more robust and sustainable growth. Over the past year, global growth has firmed. 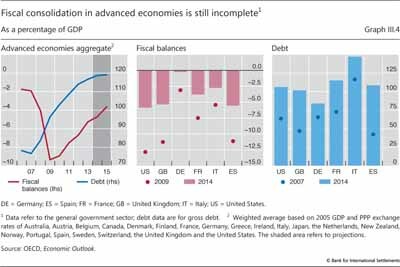 Advanced economies provided most of the uplift, supported by highly accommodative financing conditions. Thanks in part to stronger exports to advanced economies, output growth in emerging market economies (EMEs) stabilised in the second half of 2013. Yet global growth still remains below pre-crisis averages. This is not surprising. A number of advanced economies are still recovering from a balance sheet recession. Households, banks and, to a lesser extent, non-financial firms have been repairing their balance sheets and reducing excessive debt. Private sector deleveraging is most advanced in the United States, while it is far from over in other countries, including a large part of the euro area. Resources also need to move to new and more productive uses. 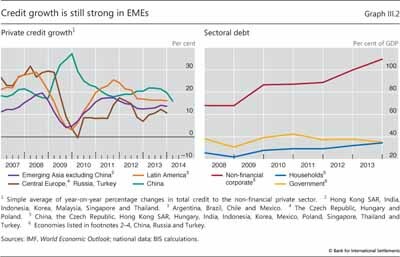 Meanwhile, many EMEs are in the late stage of financial booms, suggesting a drag on growth going forward. Restoring sustainable global growth poses significant challenges. In crisis-hit countries, it is unrealistic to expect the level of output to return to its pre-crisis trend. This would require the growth rate to exceed the pre-crisis average for several years. Historical evidence shows that this rarely happens following a balance sheet recession. Moreover, even the prospects for restoring trend growth are not bright. 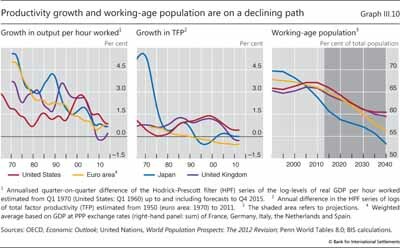 Productivity growth in advanced economies has been on a declining trend since well before the onset of the financial crisis, and the workforce is already shrinking in several countries as the population ages. Public debt is also at a record high and may act as an additional drag on growth. In many EMEs, the recent tightening of financial conditions and late-stage financial cycle risks are also clouding growth prospects. 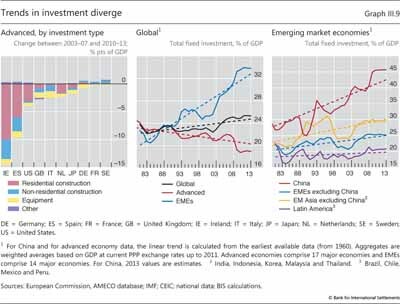 Investment is still below pre-crisis levels in many advanced economies, but this is unlikely to be a major drag on trend growth. Most of the shortfall is accounted for by the construction sector in countries that experienced large property booms and thus represents a necessary correction of previous overinvestment. That said, spending on equipment is also below the pre-crisis average owing to the weak demand and slow recovery typical of balance sheet recessions rather than the lack of finance. 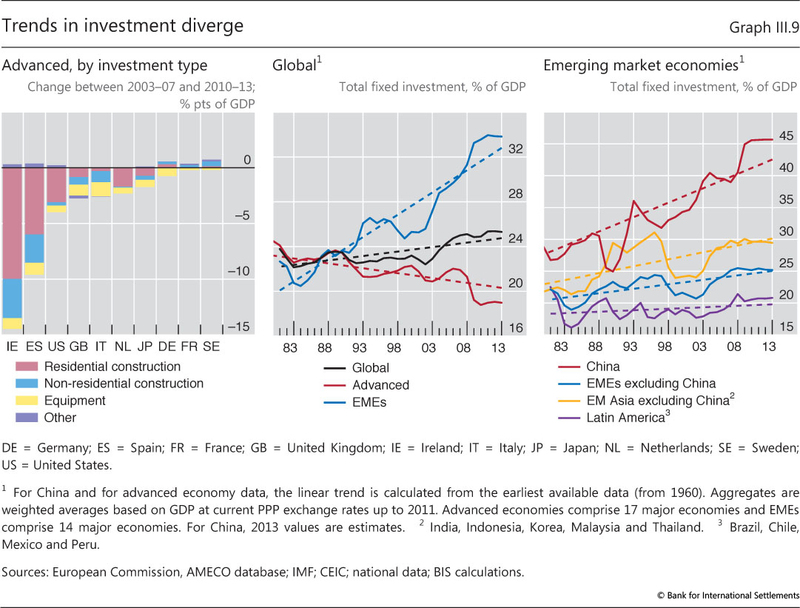 At the global level, a trend rise in investment in EMEs has offset a long downward trend in advanced economies. 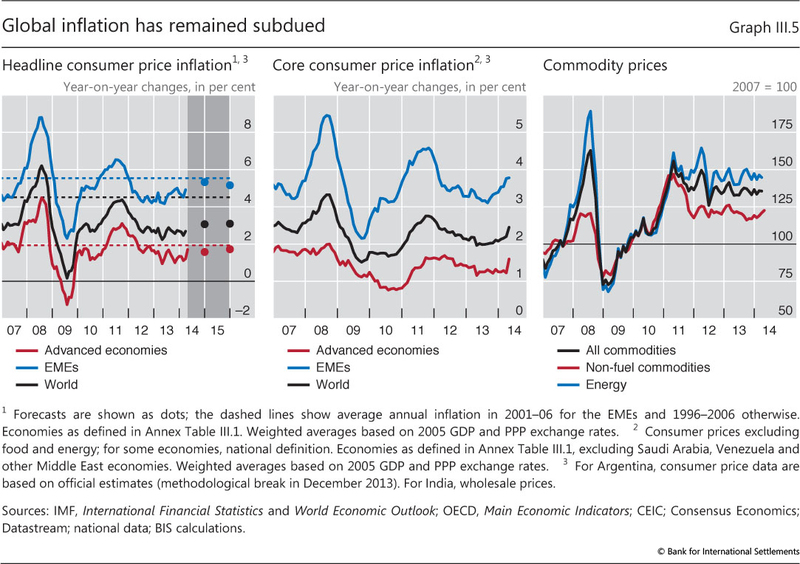 Inflation has remained low, or declined further, in many economies. A low utilisation of domestic resources is, however, unlikely to be the key driver. With greater integration of trade, finance and production, inflation has become increasingly influenced by conditions prevailing in globally integrated markets. Global factors have helped to reduce the inflation rate as well as its sensitivity to domestic conditions for a long time. Such forces may still be at play. The rest of this chapter describes the main macroeconomic developments over the past year, taking stock of the progress that crisis-hit countries have made in recovering from the 2008-09 recession. It then reviews recent developments in inflation, stressing the increasing role of global forces. Finally, the chapter discusses the possible reasons for the weakness of investment and productivity growth. 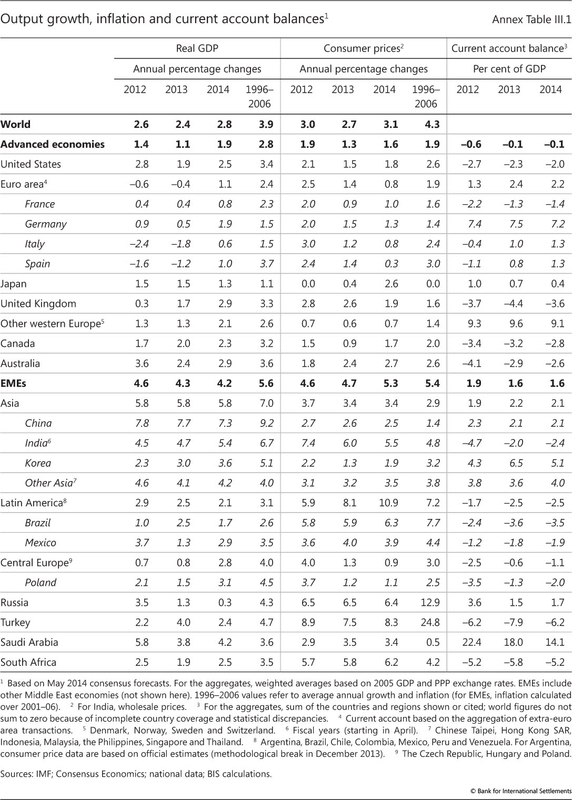 Over the past year, global economic growth gathered strength. World GDP growth increased from a 2% year-on-year rate in the first quarter of 2013 to 3% in the first quarter of 2014 (Graph III.1, left-hand panel). This compares with average growth of 3.9% in the period 1996-2006 (Annex Table III.1). 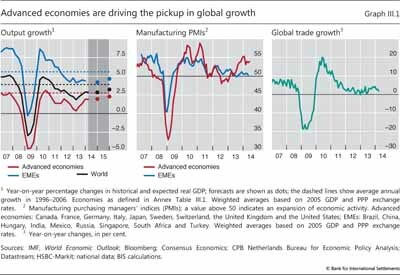 Advanced economies accounted for most of last year's increase, while growth in EMEs remained stable at a relatively low level (though still higher than that of the advanced economies). This relative shift in growth momentum is even more visible in survey indicators. The manufacturing purchasing managers' index (PMI) for advanced economies rose steadily during 2013, while that for EMEs has firmed to levels that indicate steady growth (Graph III.1, centre panel). Reflecting improved demand in advanced economies, world trade growth picked up gradually over the past year, although it was still slower than pre-crisis (Graph III.1, right-hand panel). Growth picked up rapidly in the United States and the United Kingdom. Falling unemployment, some stabilisation in housing markets and progress in private sector deleveraging supported US private consumption and, to a smaller extent, investment, lifting year-on-year US growth to about 2% in early 2014, about ¾ percentage point more than at the beginning of 2013. Despite less progress in tackling balance sheet problems, falling unemployment and a buoyant housing market also helped boost UK growth to over 3% in early 2014. The euro area returned to growth against the backdrop of receding concerns about sovereign risk and the future of the euro. Driven by Germany and initially also France, growth strengthened throughout 2013, with Italy and Spain recording positive growth rates later in the year. This return to growth benefited, in some countries, from some easing in the pace of fiscal consolidation, and was accompanied by a remarkable turnaround in financial conditions (Chapter II). Yet borrowing rates for firms and consumers remained persistently higher in Spain, Italy and other vulnerable countries than elsewhere in the euro area. Japan struggled to revive growth. GDP increased significantly in the first half of 2013, following the announcement of an ambitious economic programme. This included open-ended Bank of Japan asset purchases (until inflation reaches 2%), short-run fiscal stimulus alongside the phasing-in of tax hikes, and the commitment to implement growth-enhancing structural reforms. However, growth slowed markedly in the second half of 2013. The current account also deteriorated amid a marked depreciation of the yen. Growth bounced back strongly in early 2014 in anticipation of the first consumption tax hike in April, but the rise was expected to be partly reversed. In many EMEs, the upswing of financial cycles continued to boost aggregate demand.1 Although well below previous years, credit growth was still positive and continued to push up household and corporate non-financial debt (Graph III.2). At the same time, growth in EMEs faced two major headwinds: a continued slowdown of growth in China and a tightening of global financial conditions after May 2013 (Chapter II). China's growth has decreased by over 3 percentage points since it peaked in 2010, to about 7½% year on year in early 2014. Over the past year, in particular, Chinese authorities became increasingly worried about strong credit growth and introduced a number of restrictive financial measures, including tighter oversight of lending in the shadow banking system. The slowdown dampened growth in commodity exporters, including Russia and some Latin American countries, exporters of intermediate inputs and capital goods located mainly in Asia, and suppliers of high-tech goods such as Korea, Japan and Germany. 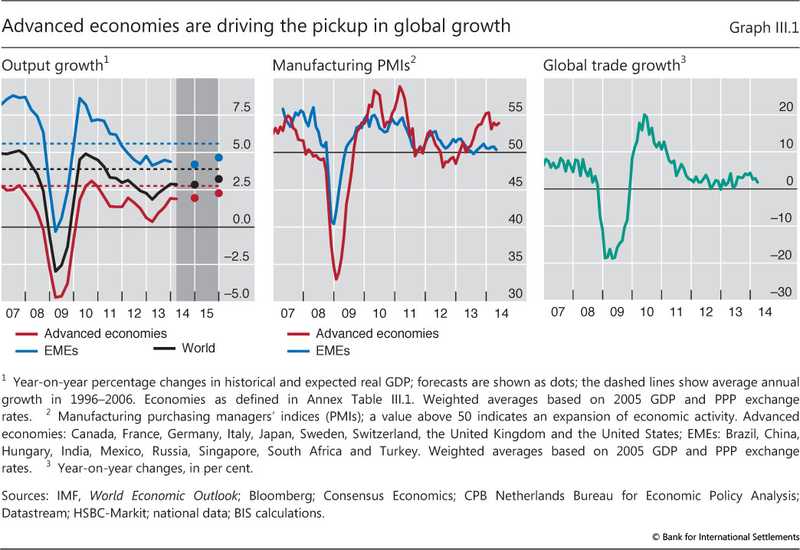 However, the recovery of exports to advanced economies since mid-2013 helped stabilise growth somewhat in EMEs. The tightening of global financial conditions since May-June 2013 initially led to larger currency depreciations and capital outflows in countries that had wider current account deficits, faster private credit growth and larger public debt. Following the market sell-off of January 2014, the countries that were hit harder were those with relatively high inflation and deteriorating growth prospects (Chapter II). The initial sell-off prompted countries such as India, Indonesia and Turkey to adopt restrictive measures, such as raising policy rates and tightening capital controls, as well as macroprudential and fiscal policy measures. In contrast, countries with positive external balances and low inflation rates, including most of emerging Asia and central and eastern Europe, were able to maintain accommodative monetary and fiscal policies or, in some cases, ease policy further to offset worsening growth prospects (Chapter V). The global economy is still coping with the legacy of the financial crisis. Despite the recent strengthening, the recovery remains weak by historical standards. 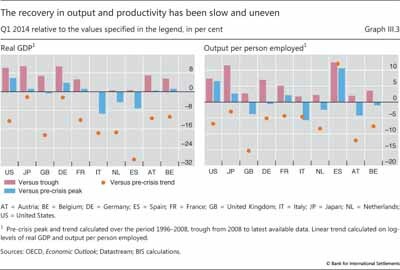 In several advanced economies, output and productivity remain below their pre-crisis peak (Graph III.3), as does employment (Annex Table III.2). This is no surprise: financial crises generally cause deeper and longer recessions and are followed by much slower recoveries (Box III.A). Severe financial or banking crises are typically accompanied by deeper and longer recessions and followed by much slower recoveries compared with standard business cycle recessions. Such crises tend to occur after prolonged financial booms and close to the peak of financial cycles (Chapter IV). The fundamental causes of these recessions are large intertemporal and sectoral imbalances, the correction of which requires large and drawn-out changes in patterns of spending. To distinguish them from ordinary business cycle recessions, they are referred to as balance sheet recessions. This box discusses the factors that make recoveries from such recessions sluggish. During financial booms, intertemporal and sectoral imbalances build up. Households, firms and often governments accumulate debt based on optimistic expectations about their future income, asset prices and the ease with which they are able to access credit. Banks overestimate the solidity of their assets, the solvency of their borrowers and their own ability to refinance themselves by rolling over short-term debt. Meanwhile, the composition of output - and hence the allocation of capital and labour across different sectors - may not match the composition of sustainable demand. One clear example is the expansion of the construction sector in several countries, with its legacy of large inventories of unsold properties. The public sector too may grow too large, and its debt may become unsustainable. Misplaced confidence and optimistic expectations sooner or later prove unfounded, triggering a collapse of asset prices and a sharp output contraction. Some agents will no longer be able to service their debt and default, imposing losses on their lenders - typically financial institutions. Others will begin reducing the stock of debt by increasing net saving and selling assets to ensure they remain solvent and have sufficient funds to meet future commitments and needs. Lenders will face soaring non-performing loans and assets. Thus, the crisis heralds a period of balance sheet adjustment in which agents prioritise balance sheet repair over spending. As one agent's spending is another's income, balance sheet repair by some agents depresses the income and value of asset holdings of others. This inevitably keeps aggregate expenditure and income growth below pre-crisis norms until debt ratios have returned to more sustainable levels and capital stock overhangs have been reabsorbed. Meanwhile, a significant fraction of capital and labour becomes idle and needs to find new uses. This generally entails the financing of new capital and creation of new firms as well as the need for unemployed workers to retrain, relocate and search for new jobs. All of this requires time and effort. The duration and intensity of the slump following a balance sheet recession depend on several factors. The first is the extent of the initial imbalances. The larger the excess during the boom, the larger is the needed correction afterwards. Financial busts tend to be associated with deeper recessions, and the speed of the recovery tends to be inversely related to the size of the preceding boom in credit and real estate. Households and firms that accumulated more debt tend to cut their spending by more than those which had less debt. The second is the extent of credit supply disruptions. After the most acute phase of the crisis, lenders usually need time to recognise losses and rebuild their capital ratios. Funding may be difficult because balance sheets are opaque and slow growth raises non- performing loans. What matters, however, is not so much the overall amount of credit that banks supply but its efficient allocation. After all, the debt overhang needs to be reabsorbed and credit demand is likely to be weak in aggregate. Indeed, empirical studies find that output growth and credit growth are at best only weakly correlated in the recovery - that is, so-called "credit-less" recoveries are the norm rather than the exception. Instead, key to a speedier recovery is that banks regain their ability to allocate credit to the most productive uses. There is also evidence that private sector deleveraging during a downturn helps induce a stronger recovery. The third factor driving the severity of the slump is the extent of structural rigidities and inefficiencies. In the presence of large sectoral imbalances, the recovery of output growth and employment tends to be stronger, other things equal, in countries that have more flexible labour markets. Finally, the policies followed by governments in managing the crisis and during the recovery phase can speed up or hinder a recovery (see Chapters I and V for a full discussion). The empirical evidence confirms that recoveries from a financial crisis are drawn-out affairs. On average, it takes about four and a half years for (per capita) output to rise above its pre-crisis peak, or about 10 years if the Great Depression is taken into account. 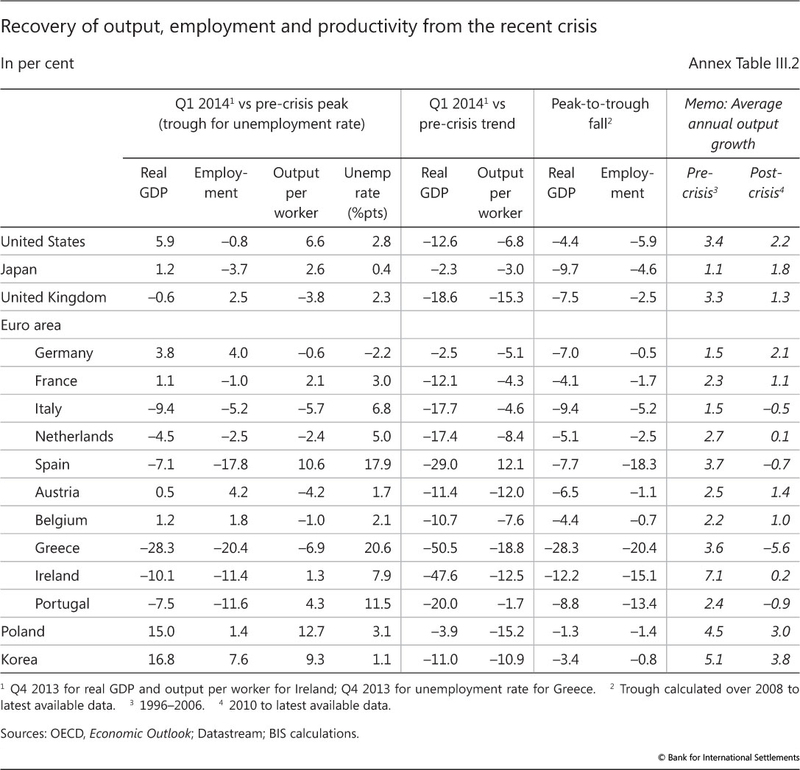 The recovery of employment is even slower (Reinhardt and Rogoff (2009)). By comparison, in a standard business cycle recession, output takes about a year and a half to return to the pre- recession peak. The evidence also points to wide dispersion around the mean, which supports the view that various factors, including those mentioned above, play a role in speeding up or slowing the recovery. The GDP losses in balance sheet recessions also tend to be larger (Box III.B). The term "balance sheet recession" was probably first introduced by R Koo, Balance Sheet Recession, John Wiley & Sons, 2003, to explain Japan's stagnant growth after the bursting of its equity and real estate bubble in the early 1990s. This box uses the same term to indicate the contraction of output associated with a financial crisis that follows a financial boom. It also embeds the term in a somewhat different analysis, which does not imply the same policy conclusions: see C Borio, "The financial cycle and macroeconomics: what have we learnt? ", BIS Working Papers, no 395, December 2012, forthcoming in Journal of Banking and Finance; and J Caruana, "Global economic and financial challenges: a tale of two views", lecture at the Harvard Kennedy School in Cambridge, Massachusetts, 9 April 2014. See also Chapter I of this Report. See eg Ò Jordà, M Schularick and A Taylor, "When credit bites back", Journal of Money, Credit and Banking, vol 45, 2013. See eg IMF, "Dealing with household debt", World Economic Outlook, April 2012, Chapter 3; K Dynan, "Is a household debt overhang holding back consumption? ", Brookings Papers on Economic Activity, Spring 2012; A Mian and A Sufi, "Household leverage and the recession of 2007-2009", IMF Economic Review, vol 58, 2010; A Mian, K Rao and A Sufi, "Household balance sheets, consumption and the economic slump", Quarterly Journal of Economics, vol 128, 2013; and C Hennessy, A Levy and T Whited, "Testing Q theory with financing frictions", Journal of Financial Economics, vol 83, 2007. See E Takáts and C Upper, "Credit growth after financial crises", BIS Working Papers, no 416, July 2013; S Claessens, A Kose and M Terrones, "What happens during recessions, crunches and busts? ", Economic Policy, vol 24, 2009; and G Calvo, A Izquierdo and E Talvi, "Phoenix miracles in emerging markets: recovery without credit from systematic financial crises", American Economic Review, vol 96, 2006. See M Bech, L Gambacorta and E Kharroubi, "Monetary policy in a downturn: are financial crises special? ", International Finance, vol 17, Spring 2014. See BIS, 83rd Annual Report, June 2013, Chapter III. C Reinhardt and K Rogoff, This time is different, Princeton University Press, 2009; see also eg D Papell and R Prodan, "The statistical behavior of GDP after financial crises and severe recessions", paper prepared for the Federal Reserve Bank of Boston conference on Long-term effects of the Great Recession, October 2011; and G Howard, R Martin and B Wilson, "Are recoveries from banking and financial crises really so different? ", International Finance Discussion Papers, no 1037, Federal Reserve Board, 2011. The crisis impact differed considerably across countries. Most directly hit were the United States, the United Kingdom, Spain and Ireland, and also several countries in central and eastern Europe. Following a boom in credit and property prices, this group of countries experienced a housing market bust and a banking crisis, leading to a full- fledged balance sheet recession. Another set of countries was affected more indirectly, especially through financial exposures to the first group. In particular, in Austria, France, Germany and Switzerland banks faced strains due to their cross-border exposures. A third group of countries, including most EMEs, commodity exporters such as Australia and Canada and Nordic countries, was indirectly hit through trade channels but subsequently buoyed by a strong increase in commodity prices. Japan and Italy did not suffer from a domestic bust or excessive cross-border exposures, but had to deal with the longer-term drag on growth resulting from high public debt, an ageing population and long-standing structural inefficiencies. While expansionary macro policies were instrumental in stabilising the global economy, the recovery path of individual countries also depended on their ability to tackle the root causes of the balance sheet recession. Among the countries that suffered a full balance sheet recession, the United States has recovered relatively fast. Since 2008, output has risen by over 10% and is now about 6% above its pre-crisis peak. To an important extent, this reflects the flexibility of the US economy, progress in household deleveraging, and determined and credible measures to strengthen bank balance sheets (Chapter VI). In the United Kingdom, which suffered an initial drop of 7½%, output has increased by 6¾%, and after six years is still about ½% below its pre-crisis peak. That said, unemployment has fallen rapidly, thanks to a relatively high degree of labour market flexibility. In the euro area, the sovereign debt crisis of 2010-12 aggravated the balance sheet problems that had remained from the earlier financial crisis. Countries that entered the euro area crisis with highly indebted households and weak banking sectors witnessed a further fall in property prices and real credit. Banking and public sector weakness reinforced each other through rising funding costs and declining asset quality. The fall in credit and property prices was particularly large in Ireland and Spain, but seems to have bottomed out recently. Italy, which had a less pronounced boom, has more recently experienced some decline in both credit aggregates and real estate prices (Chapter IV). Trade links within the euro area have also contributed to the sluggish recovery in several countries. One major exception was Germany, which suffered from the collapse of world trade in 2009 but also benefited from its quick rebound as well as from safe haven inflows from troubled euro area countries. The financial crisis continues to cast long shadows. As Graph III.3 (left-hand panel, dots) illustrates, the current level of output in advanced economies falls short of where it would have been had the pre-crisis trend continued. For instance, output is about 12½% below the path implied by a continuation of the pre-crisis trend in the United States and 18½% in the United Kingdom. The shortfall is even bigger for Spain at 29%. There are two complementary explanations for this shortfall. First, the pre-crisis trend is likely to have overestimated the sustainable level of output and growth during the financial boom. Second, the financial crisis may have permanently reduced the potential level of output. In either case, it would be a mistake to extrapolate pre-crisis average growth rates to estimate the amount of slack in the economy. To be sure, the output shortfalls shown in Graph III.3 are based on a simple linear trend, which is probably too crude a measure of pre-crisis potential growth. Yet even more sophisticated statistical measures find that, historically, permanent output losses following crises are typically large: measured as the difference between the pre-crisis trend and the new trend, the average shortfall is in the region of 7½-10% (see Box III.B for more details). Another long shadow is cast by high public debt. Although governments in advanced economies have made significant headway in reducing their fiscal deficits post-crisis, debt levels are at record highs and still rising (Graph III.4, left-hand panel). On average, fiscal deficits have narrowed since reaching 9% of GDP in 2009, and are expected to continue to shrink. Yet, at over or close to 6%, deficits are still large in Spain, the United States and the United Kingdom, where the public finances have deteriorated dramatically post-crisis (Graph III.4, centre panel). Debt has risen to over 100% of GDP in most major economies (Graph III.4, right-hand panel) (see Annex Table III.3 for further details). Not only are balance sheet recessions followed by slower recoveries than standard business cycle recessions (Box III.A), but they also involve significant output losses. Such losses have in many cases been found to be permanent - that is, output rarely returns to its pre-crisis path. Graph III.B provides an illustration. It shows two examples of how GDP may evolve after a recession associated with a financial crisis, or balance sheet recession. In both examples, point A indicates the peak reached just before the start of the crisis; point B marks the trough; and point C shows the point at which the path of GDP regains its pre-crisis trend growth rate. The difference between the two is that, in example 1, output gradually returns to the path or trend that it followed before the crisis (at point D). This means that output grows at higher rates than the pre-crisis average for several years (between points C and D). In example 2, output recovers, but not sufficiently to return to the pre-crisis trend path. Instead, GDP settles on a new trend (the dashed red line) in which the growth rate of output is the same as before the crisis, but the level is permanently lower than the pre- crisis trend (the continuous red line). The distance between the two trends (indicated by δ) is a measure of the permanent output loss. In this case, if one were to estimate potential output by extrapolating pre-crisis trends, then the output gap would be overestimated by the amount δ. Studies find that initial losses of output in a balance sheet recession - either from peak to trough (A to B) or from the peak to the point at which the growth rate returns to pre-crisis values (A to C) - are substantial, ranging from 6% to 14% on average across countries. By contrast, in standard business cycle recessions in advanced economies, output typically falls by around 2%. Most importantly, several studies find that these initial losses are only partially eliminated during the recovery from a balance sheet recession. That is, most are permanent, consistent with the scenario drawn in example 2. Unlike in Graph III.B, these studies do not rely on simple trend regressions, but usually follow Cerra and Saxena (2008) in using panel regressions of GDP (or GDP growth) to trace the average impact on output of a banking crisis. The estimated permanent losses are found to be large, between 7½% and 10%. These results appear robust to differences in samples, dating of crisis and methods of calculation, and in particular to the possibility of reverse causation - the possibility that slowing output growth could have generated the crisis. Unlike permanent losses in the level of output, there is scant evidence that a financial crisis directly causes a permanent reduction in the trend growth rate. There is, however, some evidence of indirect effects which may work through at least two channels. The first is through the adverse effects of high public debt. Public debt increases substantially after a financial crisis - by around 85% in nominal terms on average according to Reinhardt and Rogoff (2009). High public debt can be a drag on long-term average GDP growth for at least three reasons. First, as debt rises, so do interest payments. And higher debt service means higher distortionary taxes and lower productive government expenditure. Second, as debt rises, so at some point do sovereign risk premia. Economics and politics both put limits on how high tax rates can go. Thus, when rates beyond this maximum are required for debt sustainability, a country will be forced to default, either explicitly or through inflation. The probability of hitting such limits increases with the level of debt. And with higher sovereign risk premia come higher borrowing costs, lower private investment and lower long-term growth. Third, as debt rises, authorities lose the flexibility to employ countercyclical policies. This results in higher volatility, greater uncertainty and, again, lower growth. Cecchetti et al (2011) as well as a number of studies which look at advanced economies in the post-World War II period find a negative effect of public debt levels on trend growth after controlling for the typical determinants of economic growth. The second channel is an increase in resource misallocation. Market forces should normally induce less efficient firms to restructure their operations or quit the market, making more resources available to the most efficient firms. But the functioning of market forces is restricted, to an extent that varies from country to country, by labour and product market regulations, bankruptcy laws, the tax code and public subsidies as well as by inefficient credit allocation. As a result, an excessive number of less efficient firms may remain in the market, leading to lower aggregate productivity growth (and hence lower trend GDP growth) than would be possible otherwise. A financial boom generally worsens resource misallocation (as noted in Box III.A). But it is the failure to tackle the malfunctioning of the banking sector as well as to remove barriers to resource reallocation that could make the problem chronic. In the aftermath of a financial crisis, managers in troubled banks have an incentive to continue lending to troubled and usually less efficient firms (evergreening or debt forbearance). They may also cut credit to more efficient firms anticipating that they would in any case survive, yet depriving these firms of the resources needed to expand. Policymakers might tolerate these practices to avoid unpopular large bailouts and possibly large rises in unemployment from corporate restructuring. A few recent studies suggest that debt forbearance has been at play in the most recent post-crisis experience, at least in some countries. There is, in addition, considerable evidence of forbearance in Japan after the bursting of its bubble in the early 1990s. Capital and labour mobility diminished compared with the pre-crisis period. And strikingly, not only were inefficient firms kept afloat, but their market share also seems to have increased at the expense of that of more efficient firms. This shift is likely to have contributed to the decline in trend growth observed in Japan in the early 1990s. V Cerra and S Saxena, "Growth dynamics: the myth of economic recovery", American Economic Review, vol 98, 2008. For a review of the literature estimating the output losses, see Basel Committee on Banking Supervision, An assessment of the long-term economic impact of stronger capital and liquidity requirements, 2010. Not all studies, however, find a permanent shift in potential output. For instance, D Papell and R Prodan ("The statistical behavior of GDP after financial crises and severe recessions", paper prepared for the Federal Reserve Bank of Boston conference on Long-term effects of the Great Recession, October 2011) find more mixed evidence. In particular, after a severe crisis, the United States (1929) and Sweden (1991) were able to return to pre-crisis trends after about 10 years. The return to pre-crisis trend, however, may be due to other factors than the crisis (eg rearmament, structural reforms). One exception is C Ramírez, "Bank fragility, 'money under the mattress', and long-run growth: US evidence from the 'perfect' panic of 1893", Journal of Banking and Finance, vol 33, 2009. C Reinhardt and K Rogoff, This time is different, Princeton University Press, 2009. S Cecchetti, M Mohanty and F Zampolli, "The real effects of debt", in Achieving Maximum Long-Run Growth, proceedings from the symposium sponsored by the Federal Reserve Bank of Kansas City, Jackson Hole, August 2011. 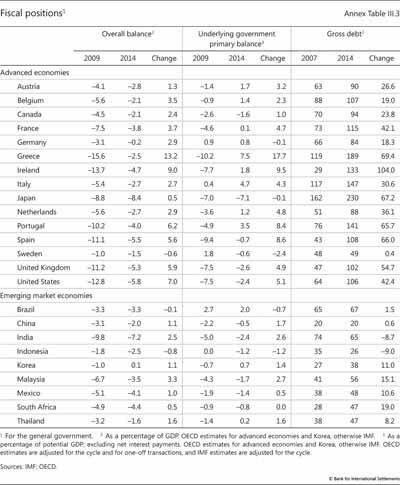 For a review of the evidence, see "Is high public debt a drag on growth? ", in BIS, 83rd Annual Report, June 2013, pp 45-6. See eg D Restuccia and R Rogerson, "Misallocation and productivity", Review of Economic Dynamics, vol 16, 2013. See eg U Albertazzi and D Marchetti, "Credit supply, flight to quality and evergreening: an analysis of bank-firm relationships in Italy after Lehman", Bank of Italy, Temi di discussione, no 756, 2010; Bank of England, Financial Stability Report, no 30, December 2011; and A Enria, "Supervisory policies and bank deleveraging: a European perspective", speech at the 21st Hyman P Minsky Conference on the State of the US and World Economies, 11-12 April 2012. On evergreening, see eg R Caballero, T Hoshi and A Kashyap, "Zombie lending and depressed restructuring in Japan", American Economic Review, vol 98, 2008; and J Peek and E Rosengren, "Unnatural selection: perverse incentives and the misallocation of credit in Japan", American Economic Review, vol 95, 2005. On the reduction of capital and labour mobility, see eg T Iwaisako, "Corporate investment and restructuring", in Reviving Japan's Economy, MIT Press, 2005, pp 275-310. On inefficient firms surviving and efficient firms quitting the market, see eg A Ahearne and N Shinada, "Zombie firms and economic stagnation in Japan", International Economics and Economic Policy, vol 2, 2005. 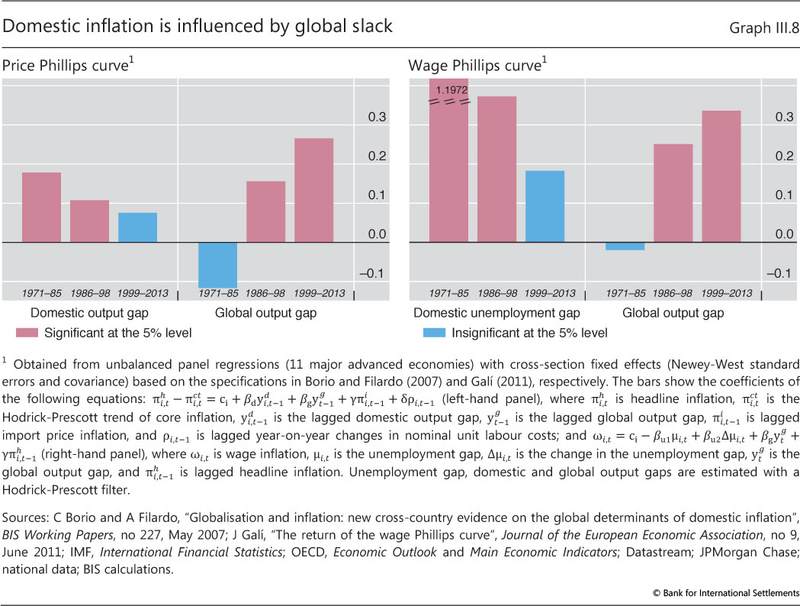 The pickup in world growth has so far not coincided with a sustained rise in inflation (Graph III.5, left-hand panel). Since mid-2013, headline measures have remained below or close to target in several countries. In particular, headline inflation stood at 0.7% in the euro area in April 2014, while it rose to 2% in the United States after being below target for several months. Japan is an exception: both core and headline inflation rates rose considerably following the announcement in early 2013 of a 2% inflation target. Headline inflation has also remained below average in EMEs. Yet inflation continued to be persistently high in Brazil, Indonesia, Russia and Turkey. 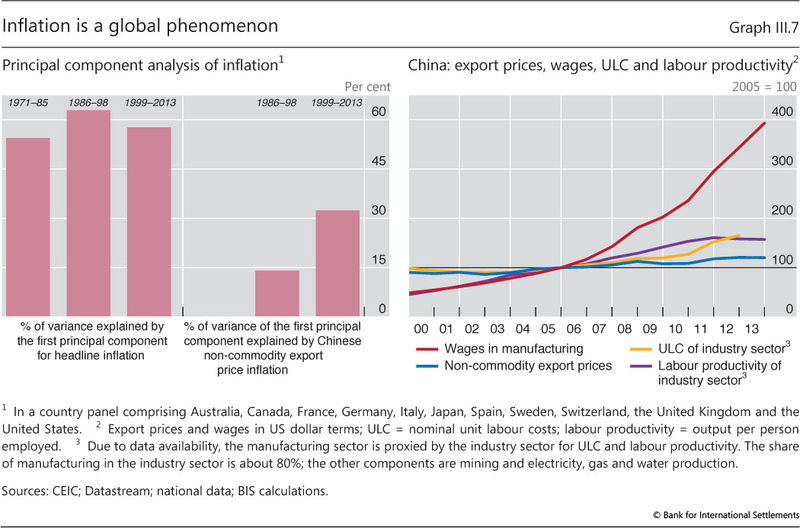 The recent stability of global inflation has largely echoed that of commodity prices (Graph III.5, right-hand panel) and of core inflation (Graph III.5, centre panel). In the United States and the euro area, core inflation continued to decline until recently, but appears to have turned, rising to 1.8% in the United States and to 1% in the euro area in April 2014. Over the past year, the extent of the inflation slowdown in the euro area exceeded forecasts. The decline was particularly pronounced in periphery countries and is likely to have been driven by structural adjustment and the restoration of competitiveness. The relative stability of inflation in advanced economies is remarkable when compared with changes in output. Not only has inflation remained subdued recently despite the recovery gaining traction, but it also fell less than many observers had expected in the immediate aftermath of the crisis, despite the deep recession. What are the factors that have kept inflation so stable? The standard framework for analysing inflation, the so-called Phillips curve, relates price inflation to past and expected inflation as well as the degree of slack within the economy - the difference between actual output and a measure of potential output. A similar version, sometimes referred to as the "wage Phillips curve", relates wage inflation to price inflation and the degree of slack in the labour market. Unfortunately, economic slack is not directly observable and cannot be measured precisely. Uncertainty about the true degree of slack is typically large in normal times, and it is even larger after a balance sheet recession. The aftermath of the Great Recession is no exception: while some indicators point to a substantial closure of the output gap, others still signal the presence of considerable unutilised capacity. Nonetheless, the dynamics of all estimates over the past year are similar: they all point to shrinking slack. But this is at odds with the recent moderation in inflation (Box III.C). Furthermore, the large output gaps observed during the 2008-09 downturn contrast with the lack of strong disinflationary pressures at that time. This suggests that the degree of domestic slack is exerting a small influence on inflation. 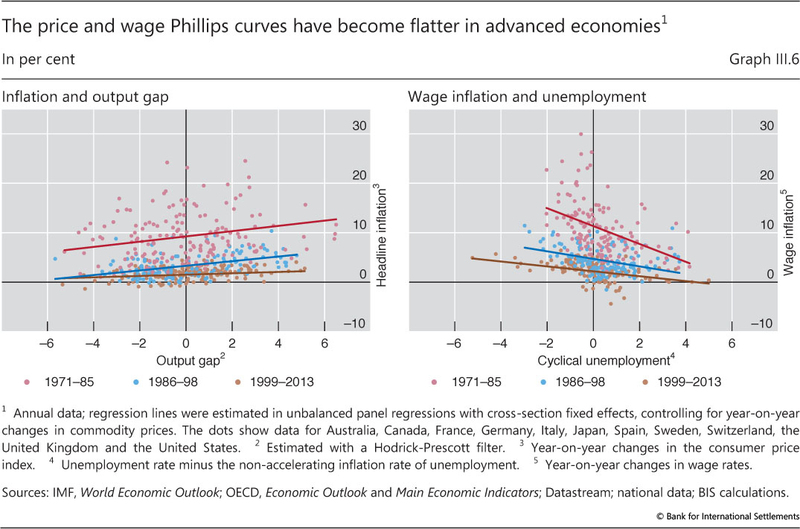 This is not a new phenomenon: the flattening of the Phillips curve seems to have started in the 1980s, and continued gradually over the subsequent years. As an illustration, the left-hand panel of Graph III.6 plots the rate of inflation against the output gap (as estimated by the Hodrick-Prescott filter) for a set of advanced economies. The regression lines show that the slope of the curve has decreased over different sample periods. The flattening is also evident when wage inflation is plotted against an estimate of the cyclical component of the unemployment rate (Graph III.6, right-hand panel). 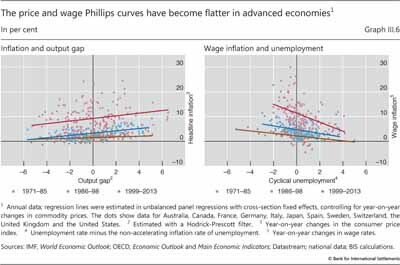 The main factor behind a flatter Phillips curve is often considered to be greater confidence in central banks' commitment to keep inflation low and stable. If firms and workers view this commitment as credible, they will look through temporary inflationary surprises, be they positive or negative, and will reset prices and wages less frequently. Thus, firmly anchored long-term inflation expectations will tend to be associated with lower cyclical inflationary pressures. Similarly, stronger credibility is also reflected in a reduced exchange rate pass-through into import and consumer prices: insofar as movements in nominal exchange rates are perceived as temporary and prices are costly to adjust, firms may simply let their margins fluctuate. Long-term inflation expectations have so far remained well anchored in major economies, contributing to the observed stability of their inflation. Even in Japan, despite many years of mild deflation, long-term inflation expectations have hovered around a positive rate of 1%. Past stability notwithstanding, financial market measures of medium-term inflation expectations in the euro area (such as swap-implied inflation rates) have declined steadily since early 2013, suggesting that market participants expect inflation to remain persistently below the upper end of the ECB's "below but close to 2%" definition of price stability (see Chapter V for a discussion of the monetary policy implications of low inflation). Potential output is a key variable for policymakers. It conveys information about the sustainability of output and the degree of economic slack. Unfortunately, potential output is not observable, not even ex post. In the past, policymakers relied on the fact that an overheating economy would normally show up in rising inflation, as demand puts increasing pressure on limited resources. Over the last few decades, however, the link between the output gap and inflation has become ever more tenuous. As a result, with inflation not increasing as much as in previous expansionary episodes, policymakers were tempted to believe that rising output could be sustained indefinitely. In fact, the signs of an unsustainable expansion took the form of unsustainable increases in credit and asset prices. This box reviews the traditional methods used for estimating potential output and compares them with a new method that explicitly takes into account financial variables. Traditional methods range from the purely statistical to those that are explicitly based on economic theory. At one end of the spectrum, univariate statistical methods, and especially the Hodrick-Prescott (HP) filter, are among the most popular. These techniques decompose the output series into a cyclical component and a trend, which is interpreted as potential output. Such methods are appealing in their simplicity and transparency but, being completely data-driven, they suffer from the so-called endpoint problem: estimates of potential output usually change substantially when new observations become available, even in the absence of any data revisions. The problem is most severe around business cycle turning points, precisely when accurate estimates are most needed. Other methods combine statistics with economic theory. A popular choice is to use models of the production function, whereby an estimate of potential output is obtained as a function of the inputs of capital and labour. Structural approaches are appealing in that movements in potential output can be attributed to economic factors. Yet they are also prone to errors, reflecting misspecification of the underlying model, as well as uncertainties in its parameter estimates and in the measurement of the variables. Furthermore, these methods, too, can entail substantial endpoint problems, since they rely heavily on pure statistical filters to smooth out cyclical fluctuations in factor inputs. Orphanides and Van Norden (2005) find that real-time estimates of output gaps have low explanatory power for inflation developments compared with estimates based on ex post data, and that revisions could be as large as the output gap itself. Recently, Borio et al (2013) introduced a Kalman filter method for estimating the output gap which incorporates information about credit and property prices (Chapter IV). Their approach accounts for the fact that credit expansion and buoyant asset prices might push output to unsustainably high levels, but are not always accompanied by rising consumer price inflation. One reason is that financial booms often coincide with temporary expansion of supply capacity, which tends to dampen price pressures. Thus, including financial variables leads to estimates of the trend component which are less affected by unsustainable financial booms. The corresponding "finance- neutral" output gap indicates how far output is from its sustainable level. Differences among different methods are illustrated in Graph III.C: the left-hand panel shows the output gap for the United States estimated using the popular HP filter; the centre panel shows the same variable estimated using the OECD production function approach; and the right-hand panel shows the "finance-neutral" estimate. The first two measures failed to indicate in real time that the economy had been overheating in the run-up to the Great Recession: the estimates of the output gap obtained with the same methods after having observed the recession are significantly different. In contrast, both the real-time and ex post estimates of the output gap obtained with the "finance-neutral" filter are much more aligned. And, more importantly, the real-time estimate was clearly signalling that output was above sustainable levels well before the onset of the recession. The uncertainty surrounding output gap estimates is likely to be much higher after a balance sheet recession than a standard business cycle recession. Output losses are typically permanent, although there is uncertainty about how large they could be (Box III.B). 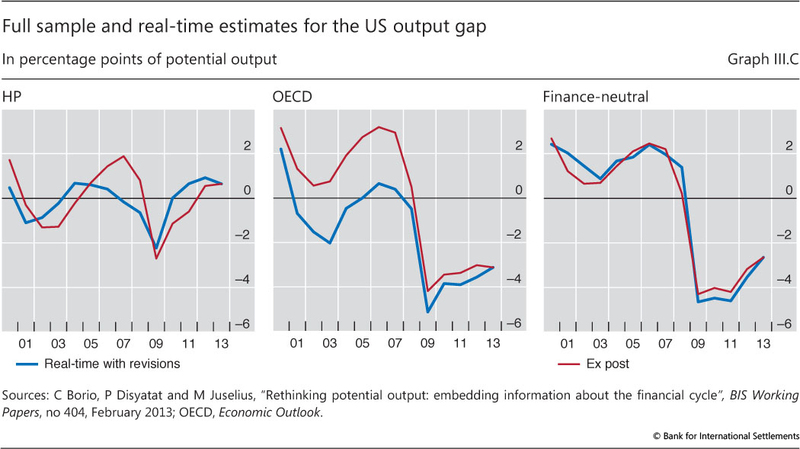 In this respect, estimates of the output gap based on different methods paint a very different picture. The measure obtained with the HP filter suggests that the output gap in the United States has been closed. By contrast, the measure based on the OECD production function continues to indicate ample economic slack, at over 3% of potential output in 2013. The finance-neutral gap indicates a similar amount of slack, but with a vigorous pickup over the most recent quarters, as credit growth resumed. 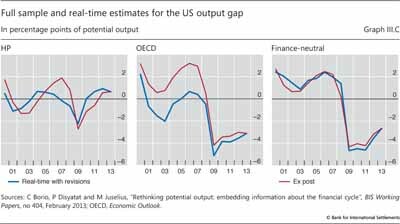 It must be noted, however, that the finance-neutral output gap too is likely to overestimate the true amount of slack in the aftermath of a balance sheet recession to the extent that it adjusts only slowly to the permanent losses in output. A Orphanides and S Van Norden, "The reliability of inflation forecasts based on output gap estimates in real time", Journal of Money, Credit and Banking, vol 37, June 2005. C Borio, P Disyatat and M Juselius, "Rethinking potential output: embedding information about the financial cycle", BIS Working Papers, no 404, February 2013. See also D Arseneau and M Kiley, "The role of financial imbalances in assessing the state of the economy", FEDS Notes, April 2014. Even if augmented with financial variables, the "finance-neutral" filter does not capture the large non-linear effects of financial busts on the level of potential output, except only gradually over time. For example, real-time estimates of the Swedish output gap in the years following the financial bust of the early 1990s were considerably lower than ex post estimates. A bigger role for global factors? Along with greater central bank credibility, an additional factor that can explain why inflation has become ever less tied to domestic developments is the much greater interconnectedness of the world economy. The last three decades have seen the entry and growing integration into the global economy of China and India (which together make up almost 40% of world population), former communist countries and many other EMEs. Advances in communication technology and logistics have facilitated the creation of extensive global production chains. Many international firms, in particular, have relocated part of their production processes to EMEs with an ample supply of labour. And further scope for relocation remains. 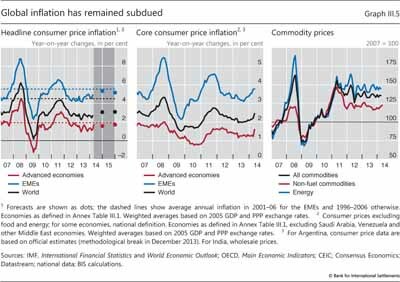 Swings in commodity prices are important drivers of global inflation. And these are in turn increasingly related to global demand conditions, rather than idiosyncratic supply developments. Strong growth and improvements in living standards in EMEs have pushed up not only the prices of industrial commodities, but also those of food. In turn, higher commodity prices have fed into other countries' inflation rates, regardless of their relative cyclical position. 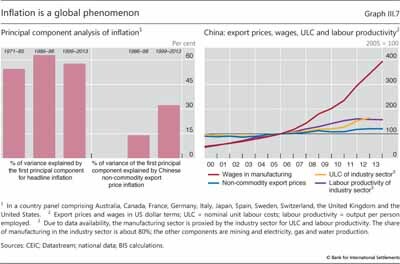 However, despite the upward pressure on commodity prices from demand in EMEs, the overall impact of globalisation on advanced economies has been largely disinflationary so far. The rapid industrialisation of large EMEs with a huge supply of cheap labour has boosted productive capacity, holding down merchandise goods prices. China's role, in particular, has increased substantially over the past decade and a half (Graph III.7, left-hand panel): the share of the variation in advanced economies' inflation explained by Chinese export price inflation doubled to over 30% in the period 1999-2013 compared with 1986-98. At the same time, the prices of Chinese export goods remained remarkably subdued, even against the background of rising compensation and unit labour costs: they are now still relatively close to the 2005 level (Graph III.7, right-hand panel). 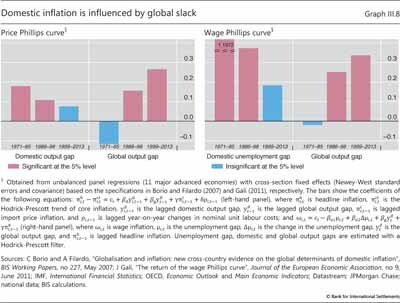 To further illustrate the growing role of global factors in driving inflation, one can augment standard specifications of the Phillips curve with a measure of the global output gap. The left-hand panel of Graph III.8 reports estimates of the slope of the price Phillips curve with respect to the domestic and global output gap, obtained over different samples from a panel of advanced economies. The coefficient on the domestic output gap declines and becomes statistically insignificant from the end of the 1990s onwards, while the coefficient on the global output gap gains relevance. The results are very similar for a similarly augmented wage Phillips curve. Looking ahead, it is unclear to what extent the greater role of global factors will continue to affect domestic inflation. The strength of disinflationary tailwinds crucially depends on differences in the levels of wages and unit labour costs across countries. These differences have been narrowing. In China, for example, wages in the manufacturing sector have increased steadily while labour productivity growth appears to have slowed somewhat in recent years. If not met by similar gains in productivity, wage rises will eventually put upward pressure on export prices. Disinflationary tailwinds, however, do not appear to have run their full course yet. And there is still scope for further integration into the global economy of low-income countries with an ample supply of cheap labour. Since 2009, investment and labour productivity growth have lagged behind previous recoveries. Total gross fixed investment in advanced economies is generally lower than before the crisis (Graph III.9, left-hand panel). The largest investment shortfall has occurred in countries that experienced the strongest real estate booms: 14 percentage points in Ireland, 9 in Spain, 4 in the United States and 3 in the United Kingdom. Construction accounts for most of the drop. But spending on equipment is also below the pre-crisis average in many countries, reflecting weakness of demand and the slow recovery typical of balance sheet recessions. It is unrealistic to expect investment, as a share of GDP, to return to its pre-crisis level in advanced economies. The drop in construction spending is a necessary correction of previous overinvestment and is unlikely to be entirely reversed. Moreover, the investment share had been on a downward trend long before the crisis, suggesting that, as output growth recovers, investment may settle below the pre-crisis average. 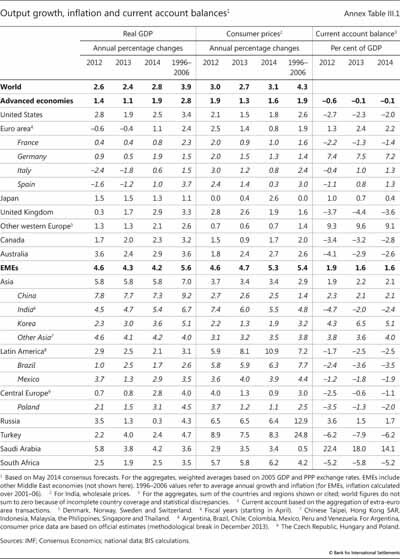 This downward trend in advanced economies reflects a number of factors. One is the decline in trend growth over the past few decades. Since the capital-to-output ratio has generally remained stable or risen slightly in most countries, a smaller share of GDP needs to be invested to keep the ratio constant over time. A second factor is a shift in the composition of output from capital-intensive manufacturing sectors towards less capital-intensive service sectors. Third, to the extent that the decline in output growth is driven by exogenous factors, such as adverse demographics, a slower pace of technological innovation or shifting long-run patterns in consumer demand, the associated fall in the investment-to-GDP ratio would be a natural consequence of this slowdown, rather than a driving force. Moreover, the investment weakness may be overstated. Over the past few decades, the relative prices of investment goods have been trending down: firms have been able to keep their capital stocks constant by spending less in nominal terms. In fact, in real terms, investment spending has fluctuated around a mildly increasing, not decreasing, trend in advanced economies. In addition, official statistics may underestimate intangible investment (spending on research and development, training, etc), which has been gaining importance in serviced-based economies. Finally, and most importantly, at the global level investment is not weak. The secular drop in the investment-to-GDP share in advanced economies has been offset by a trend increase in EMEs (Graph III.9, centre panel). Part of it reflects strong investment in China, which at close to 45% of GDP looks unsustainably high (Graph III.9, right-hand panel). But even excluding China, EME investment has trended up, albeit at a more moderate pace, in particular in emerging Asia. This broad picture, however, does not mean that investment could not or should not be higher. Ageing infrastructure is a potential drag on growth in the United States, the United Kingdom and other advanced economies. In parts of the euro area, product market and other rigidities hold back business investment. And supply bottlenecks are having similar effects in several EMEs, including South Africa, Brazil and various other Latin American countries. Factors that can potentially hold back a cyclical pickup of investment include a lack of finance and weak aggregate demand. But in fact financial conditions are extremely favourable. The cost of capital in major economies has generally fallen below pre-crisis levels, thanks to very low interest rates and buoyant equity valuations. Large firms generally have no problem borrowing from banks. And bond financing has been readily available on extraordinarily good terms around the world, including to firms without an investment grade rating (Chapters II and VI). Thanks to easy finance and a recovery in profitability, the net financial balance of the non-financial corporate sector has continued to improve. It is now back to surplus in several advanced economies, at similar levels to those prevailing pre-crisis. In the United States, for example, internal earnings (net of taxes and dividends plus depreciation charges) have consistently exceeded capital spending since 2009. On top of this, US firms have also continued to issue long-term debt to exploit record low yields. And equity is being withdrawn faster than it is raised, as firms pay higher dividends, buy back shares and engage in mergers and acquisitions. Access to finance may still be a problem for small and medium-sized firms in countries where the banking sector is still impaired, such as parts of Europe. Improving the supply of finance for these firms requires that banks recognise their losses and recapitalise. Monetary stimulus per se is unlikely to have additional significant effects (Chapters I and V). With finance not a constraint, the cyclical weakness of investment is better explained by the slow recovery in aggregate demand that is typical of balance sheet recessions. As agents repair balance sheets, their spending remains below pre-crisis norms, depressing the income of other agents and so prolonging the adjustment phase (Box III.A). The necessary consolidation of public finances may further slow growth in the short term. As the recovery proceeds, investment should pick up. Indeed, investment growth has already risen in recent quarters, albeit modestly, in a number of countries, including Germany, the United States and the United Kingdom. The current weakness of aggregate demand may suggest the need for further monetary stimulus or for easing the pace of fiscal consolidation. However, these policies are likely to be either ineffective in current circumstances (Chapter V) or unsustainable: taking a long-term perspective, they may simply succeed in bringing forward spending from the future rather than increasing its overall amount over the long run, while leading to a further rise in public and private debt. Instead, the only way to boost demand in a sustainable manner is to raise the production capacity of the economy by removing barriers to productive investment and the reallocation of resources. This is even more important in the face of declining productivity growth. Since 2010, labour productivity growth has been below pre-crisis averages in most advanced economies and has so far risen much more slowly than in previous business cycle recoveries. For instance, it has averaged about 1% in both the United States and Germany, compared with 2.3% and 1.8%, respectively, over the pre-crisis decade; and it has been close to zero in the United Kingdom, against a pre-crisis average of 2½%. 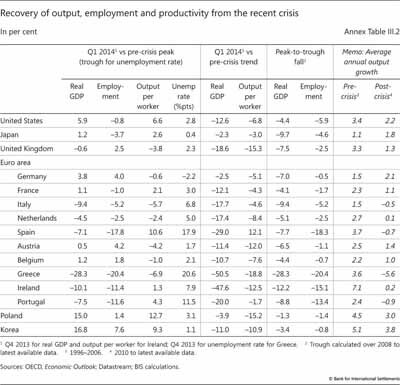 Spain is an exception: there it has risen above pre-crisis averages following the large decline in employment. Part of the weakness of productivity growth since the start of the recovery reflects (as noted earlier) the slow recovery typical of a balance sheet recession. But it also reflects, to some degree, the continuation of a downward trend which began well before the onset of the financial crisis (Graph III.10, left-hand panel). Such a trend is also evident in estimates of total factor productivity (TFP), which measures the efficiency with which both capital and labour are employed in production (Graph III.10, centre panel). In the United States and the United Kingdom, both measures indicate that productivity growth underwent a revival from the mid-1980s till the early 2000s, but has since subsided. TFP growth in the euro area, by contrast, has been falling steadily since the early 1970s and is currently negative. TFP growth in Japan has also clearly lagged behind that of the United States: it first fell sharply and then turned negative during the financial bust of the early 1990s, recovering somewhat only in the early 2000s. The productivity growth slowdown, which may have been partly obscured by the pre-crisis financial boom, is likely to reflect deeper factors. The first is the pace of technological innovation, which is, however, difficult to predict. One pessimistic view is that the information technology revolution led only to a temporary one-off revival of productivity, which ran its course before the start of the crisis.5 The second is patterns of demand: the shift towards low-productivity growth sectors, such as services (health care, education, leisure, etc) tends to reduce aggregate productivity growth.6 The third is the worsening of various structural impediments to the efficient allocation of resources, which may prevent the adoption and the efficient use of the latest technology. High levels of public debt may also weigh negatively (see Box III.B for details). The misallocation of resources is likely to have worsened further in the wake of the financial crisis. Existing evidence suggests that in crisis-hit countries low interest rates and forbearance might be locking up resources in inefficient companies. For example, firm-level data indicate that in the United Kingdom around one third of the productivity slowdown since 2007 is due to slower reallocation of resources between firms, in terms of both labour movements between firms and firms' market exit and entry.7 Countries that have been too slow in repairing their balance sheets may in some respects resemble Japan after its early 1990s financial bust (Box III.B). Unless productivity growth picks up, the prospects for output growth are dim. 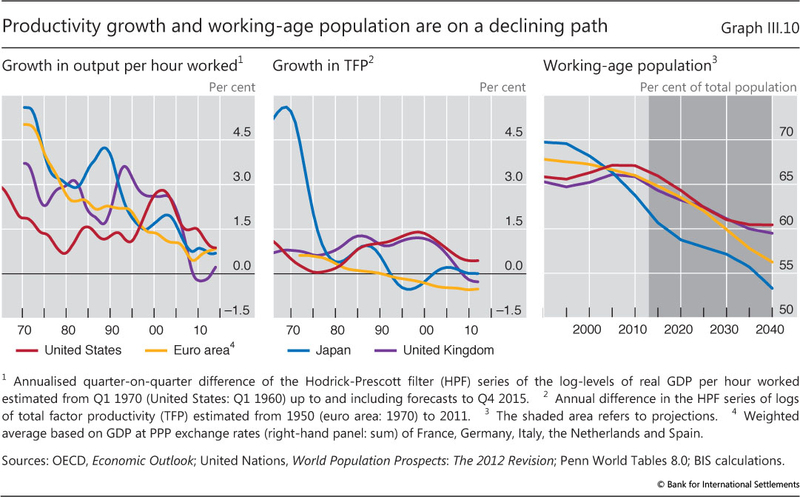 In particular, population ageing in many advanced economies, and not only there, will act as a drag on growth. The share of the working-age population has been falling in the euro area and, even more rapidly, in Japan. In the United States and the United Kingdom, it peaked just before the beginning of the financial crisis (Graph III.10, right-hand panel). 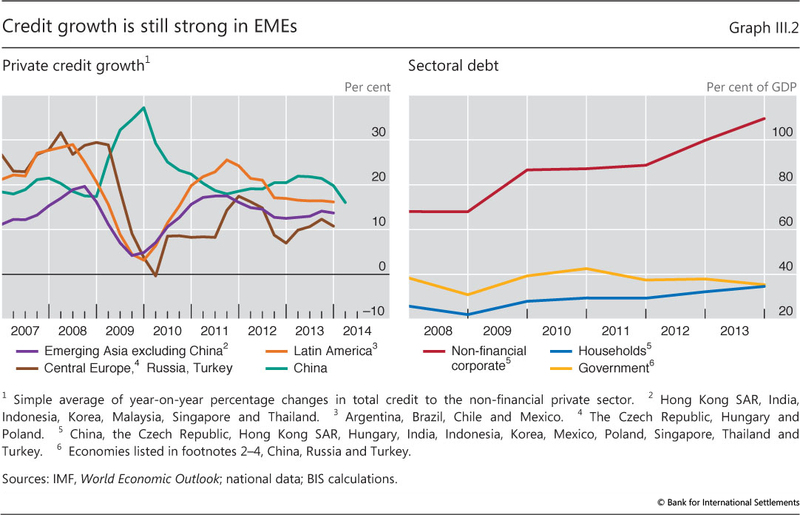 Several EMEs have until recently displayed stable or even rising productivity growth. 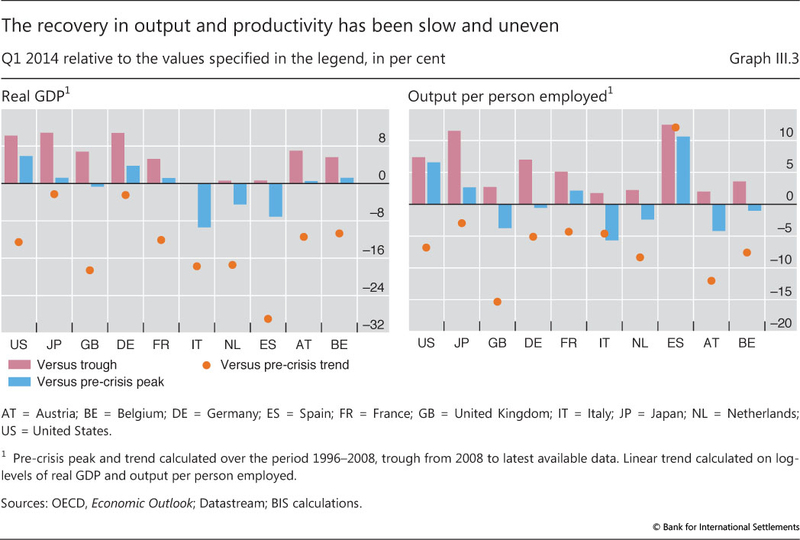 But productivity growth may have turned in some countries. The recent financial booms may partly obscure the fact that improvements in efficiency may become harder to achieve. As an economy reaches middle income levels, the size of the manufacturing sector peaks and demand for services becomes more important. This makes it harder to close the productivity gap with the most advanced economies: quite apart from slower productivity growth in the service sector, institutional and structural weaknesses tend to be a stronger drag on the service sector than on manufacturing. Increasing demographic headwinds are also expected to weigh on growth in a number of EMEs. These considerations suggest that sustainable long-term growth requires structural measures that directly tackle the sources of low productivity rather than policies aimed at stimulating aggregate demand. Relaxing supply constraints may also have positive spillovers on current demand, as agents could spend more in anticipation of higher future income. By contrast, debt-financed stimulus may be less effective than hoped and raise long-term sustainability issues (Chapter V). 1 The financial cycle is different from the business cycle. It is best measured by a combination of credit aggregates and property prices and lasts much longer, roughly 15 to 20 years. See Chapter IV for a full discussion. 2 See C Borio and A Filardo, "Globalisation and inflation: new cross-country evidence on the global determinants of domestic inflation", BIS Working Papers, no 227, May 2007, for more details. 3 Greater migration flows seem to have had only a modest mitigating impact on wage demands in destination countries. See eg G Ottaviano and G Peri, "Rethinking the effect of immigration on wages", Journal of the European Economic Association, February 2012, and S Lemos and J Portes, "New Labour? The effects of migration from central and eastern Europe on unemployment and wages in the U.K.", The B.E. Journal of Economic Analysis and Policy, January 2014, for evidence on the United States and the United Kingdom, respectively. 4 Globalisation might have also contributed to reducing the measured degree of exchange rate pass-through to domestic prices. Large manufacturing firms can distribute production over a larger number of countries and rapidly switch suppliers, thereby minimising the impact on their final product of currency movements in a single country. For a review of the literature, see eg J Bailliu, W Dong and J Murray, "Has exchange rate pass-through really declined? Some recent insights from the literature", Bank of Canada Review, Autumn 2010. 5 For a pessimistic view, see eg R Gordon, "U.S. productivity growth: the slowdown has returned after a temporary revival", International Productivity Monitor, 2013. For an optimistic view, see M Baily, J Manyika and S Gupta, "U.S. productivity growth: an optimistic perspective", International Productivity Monitor, 2013. 6 See eg C Echevarría, "Changes in sectoral composition associated with economic growth", International Economic Review, vol 38, 1997; and M Duarte and D Restuccia, "The role of structural transformation in aggregate productivity", Quarterly Journal of Economics, vol 125, 2010. 7 See A Barnett, A Chiu, J Franklin and M Sebastia-Barriel, "The productivity puzzle: a firm-level investigation into employment behaviour and resource allocation over the crisis", Bank of England Working Papers, no 495, April 2014. 8 See eg OECD, Economic Policy Reforms 2014: Going for Growth Interim Report, April 2014. 9 Fiscal adjustment needs are particularly large in Japan, the United States, the United Kingdom, France and Spain. Most of the required adjustment in the United States and the United Kingdom is due to age-related spending, which is expected to rise rapidly by the end of the current decade in the absence of reforms. For a more detailed analysis, see BIS, 83rd Annual Report, June 2013, Chapter IV.